I'm on fire doing donabe cooking with all the summer vegetables. And, of course, my appetite for tomato curry grows even bigger especially in the summer time. 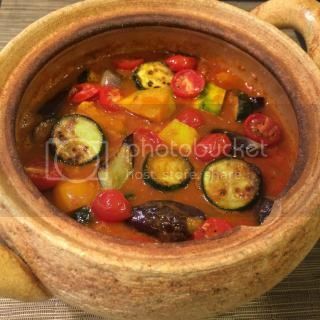 This dish can be made with very similar ingredients as making ratatouille. The big difference is the spice. Just like my ratatouille, vegetables can be sun-dried beforehand. But, in this recipe, I simply salted eggplant and zucchini to take some moisture out before cooking. Cherry tomatoes and kabocha are cooked separately in the oven. They can be directly added to donabe without pre-cooked, but these extra steps make the dish taste much nicer. Kabocha tastes sweeter and its texture is much better aftert it's roasted. Here's my summer vegetable curry recipe. The dish is completely vegan, and extremely satisfying. I use shio-koji to season the dish, so this brings up the umami flavors in this dish. My husband loves it so much he says he can finish the whole donabe-ful of it himself. My soup & stew donabe, "Miso-shiru Nabe", stays so busy during the summertime. 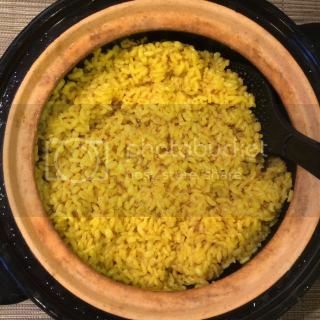 The curry is served with my donabe turmeric rice, which was made in double-lid donabe rice cooker, "Kamdo-san". This time, I used just water, instead of vegetable stock, and added some mochi-mugi (sweet barley) to brown rice. It was so nice with the curry. 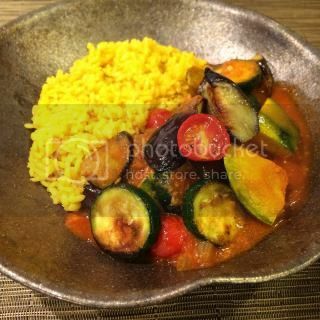 Vegetable curry and turmeric rice, both were made in donabe. It's so hard to stop eating. Pre-heat the oven at 350F (180C) degrees. In a sheet pan, toss the halved cherry tomatoes in some olive oil, salt, and pepper. Spread in one layer. Roast in the oven for 25 minutes. Set aside. Turn up the oven to 450F (230C) degrees. In another sheet pan, toss the kabocha in some olive oil, salt, and pepper. Spread in one layer. Roast in the oven until it's just tender (15 - 20 minutes). Set aside. Put the eggplants and zucchini in colanders separately and sprinkle some salt and leave to let them sweat for 15 minutes. Rinse and pat dry. Heat 2 tablespoons olive oil in a pan and sauté the eggplants over medium to medium-high heat until golden brown. Transfer the eggplants to a plate lined with paper towel to drain excess grease. Set aside. Wipe off the grease from the pan and heat 1 tablespoon olive oil. Sauté the zucchini over medium-high heat until golden brown. Transfer the eggplants to a plate lined with paper towel to drain excess grease. Set aside. In "Miso-shiru Nabe", heat 1 tablespoon olive oil and sauté the onions for 20-25 minutes until the onions are lightly browned. Add the garlic, ginger, cumin seeds, and bell pepper. Sauté until the bell pepper is softer (2-3 minutes). Add the curry powder, and cayenne. Continue to sauté for a minute or so until the mixture becomes fragrant. Add the bay leaves, tomato sauce, and vegetable stock. Turn up the heat to medium-high. As soon as the mixture (curry) starts almost boiling, turn the heat down to medium-low. Simmer for 10 minutes. Add the garam masala and shio-koji, and ground some black pepper. Adjust the seasoning with some salt, if necessary. Add the rest of the vegetables, and stir. Bring back to simmer and turn off the heat. Serve with donabe turmeric rice or plain rice.